It’s out! Available in stores, online and of course at Reggiesworld.com! 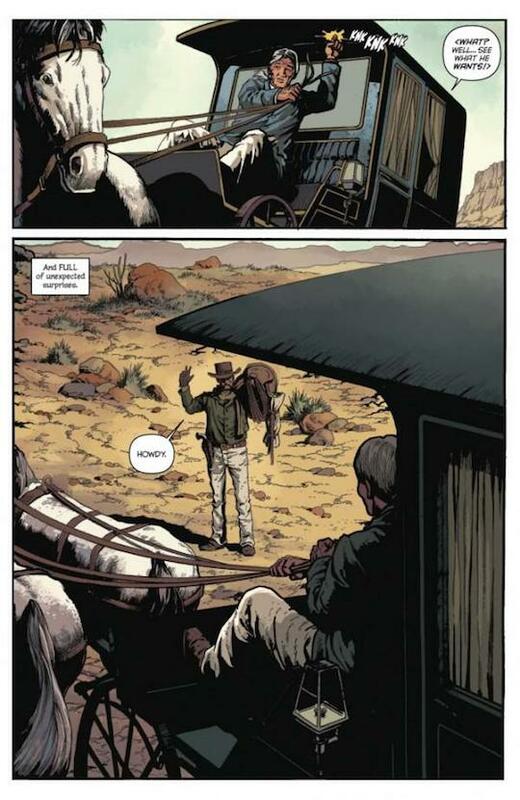 Check out the first installment of DJANGO/ZORRO, the comic book sequel to DJANGO UNCHAINED. I first met Quentin Tarantino when we got together to discuss the possibility of co-writing the first official sequel to any of his films, a comic-book adventure that would match the title character of DJANGO UNCHAINED with a classic character that I had helped redefine in recent years—the original masked-and-caped crusader, ZORRO! Our connection was immediate and genuine and I knew that would translate into the adventures of our respective characters. Since the time frames of these two narratives were off by many years, I figured we’d need to invent a legacy version of Zorro—an all new character who takes up the masked identity for whatever reason in the years just preceding the American Civil War. But Quentin was adamant that we use the original Don Diego de la Vega in our tale. “No, no, no,” he insisted, “It’s gotta be the original Zorro! It’s gotta be your Zorro!” I immediately saw how well such a scenario could work; in the film, Django Freeman enjoys a close relationship with another older man who serves as something of a mentor during his budding days as a bounty hunter, Dr. King Schultz. This motif provided us with an easy basis for our heroes’ interaction and, just like that, our story was up and running! PG. 1—One of the things that intrigued us was the longterm effect of Diego’s masquerade on his personality. We immediately get from the narration that, despite his age, Diego has never really stopped his crusade as Zorro. To a great extent, Zorro is his truer persona—dashing, adventurous, always fighting for the cause of justice. But how would several decades of acting the part of the foppish aristocrat version of Don Diego affect him? To some degree…he must actually become that person as well. It’s an interesting concept…when does the man become the masquerade and the masquerade become the man? Thus, we hear Diego’s fussy and somewhat cantankerous commentary to his driver and milk-brother, Bernardo…who obviously enjoys pushing his friend’s buttons to some degree. Bernardo is also our initial narrator; as I had established in my first arc on writing Zorro, he has taken it upon to himself to act as chronicler for his hermano’s many astounding adventures. PG. 2—Here we see some of the secretive language that Diego and Bernardo (who is mute) have used since they were children. In this case, a coded knock that lets Diego know that they have encountered someone…unexpected. And, just like that, our two heroes’ paths converge. PG. 3—As he offers this dusty stranger a ride, the shadow from the carriage’s curtain mimics the shape of Zorro’s traditional mask on Diego’s face. Django, so used to racial segregation (at best) naturally assumes he’s supposed to ride up front with the driver. PG. 4—But, much to his surprise, this white man is seemingly devoid of racial prejudice and invites him to share his carriage compartment as an honored guest. 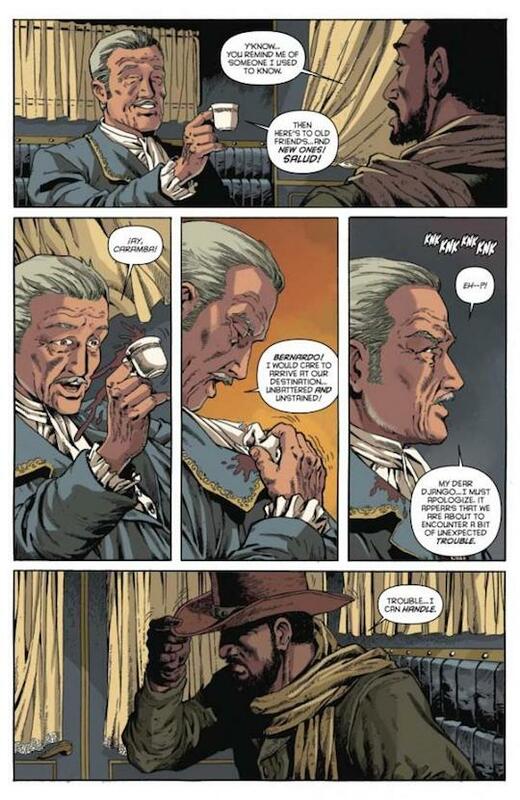 I just love that final panel where we see the rough-and-tumble Django somewhat awkwardly holding a fine china tea-cup in one hand and a cucumber canapé in the other! PG. 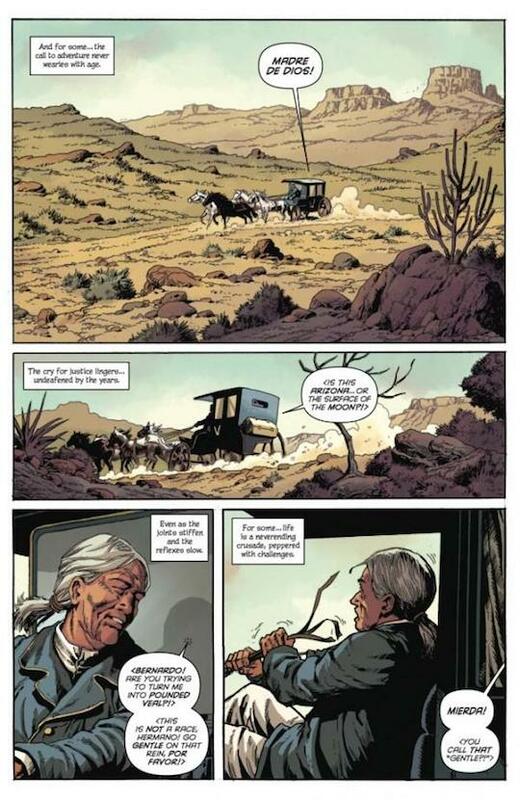 5—One of the things we decided early on was to not waste any time presenting these characters as if to new readers. 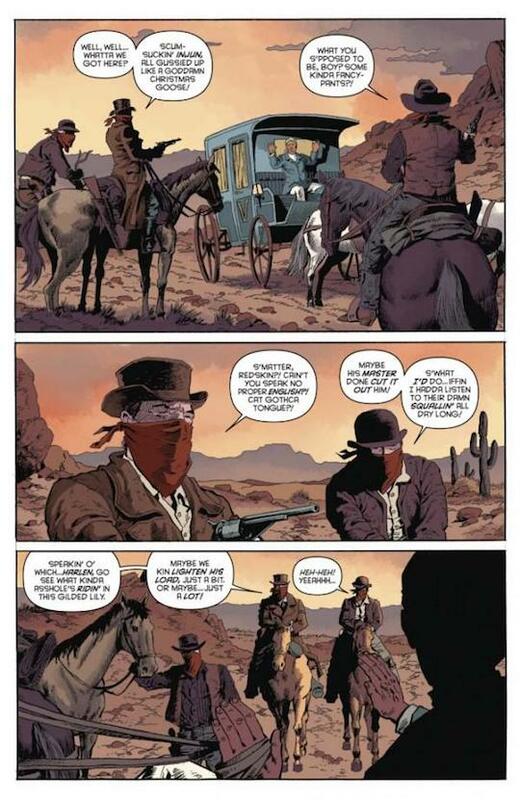 If you’re buying and reading this comic at all, it’s a pretty safe bet that you’ve seen Django Unchained and, let’s face it, who doesn’t know who Zorro is? 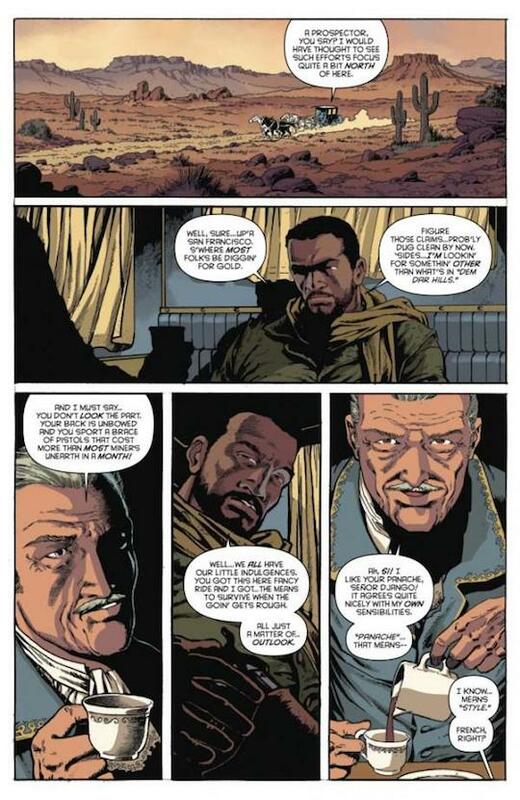 So…on this page we realize that Django isn’t being entirely upfront with his host by claiming to be a prospector. But Diego isn’t so easily fooled. PG. 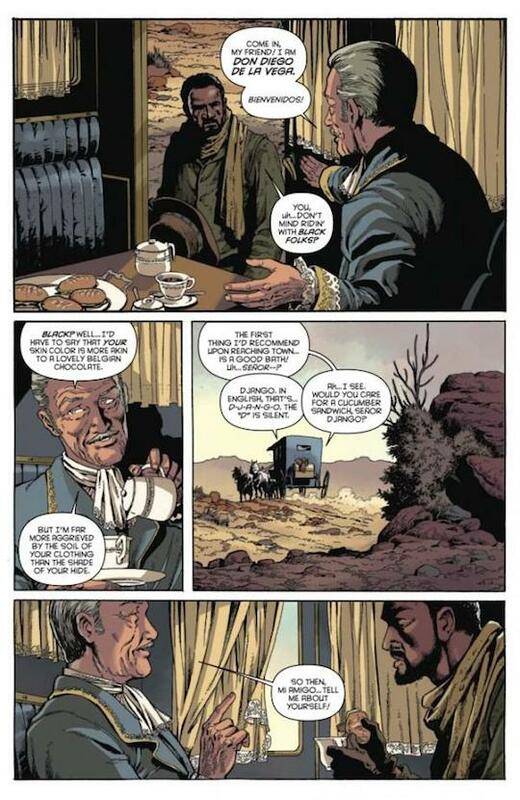 6—Django finds himself intrigued by this unassuming gentleman whom, he admits, reminds him of King. Then suddenly, this getting-to-know-you session is interrupted by another knock from Bernardo. But this is a different knock. A different code. Trouble brewing. And Django seems to have actually been ready and waiting for just such an intrusion. 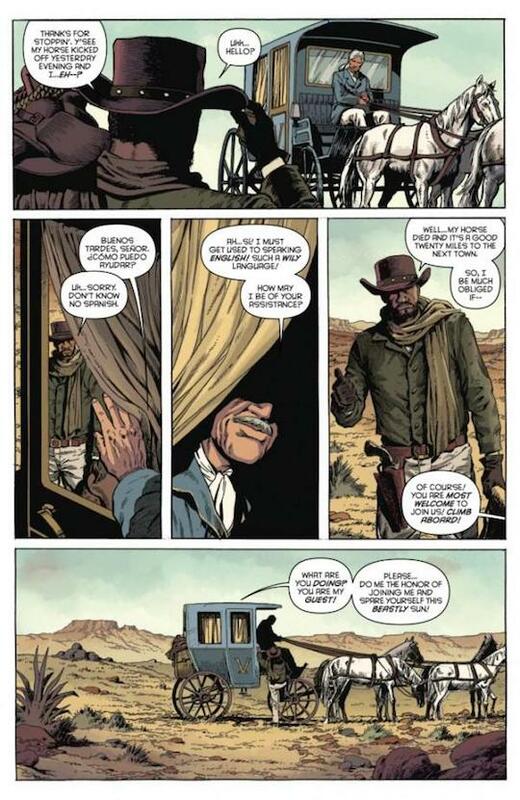 For more on Django / Zorro #1, click here. 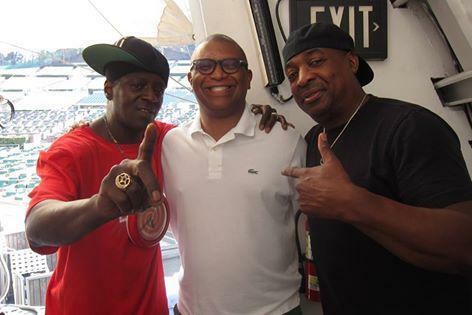 PE and ME! We’ve known each other for years, and they delivered a crucial song for the HOUSE PARTY soundtrack, but this is our first photo together. 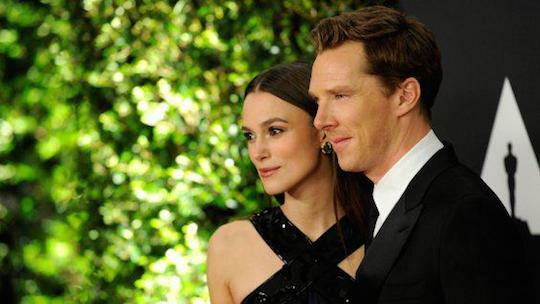 They are really both lovely guys and great to work with. It’s nice to be a fan of the artist and the person. I’ve gone to Hollywood Bowl shows since I came to Los Angeles, but to finally have my own show on the marquee is a charge I haven’t felt since I started making movies and would see film titles on a cinema marquee. 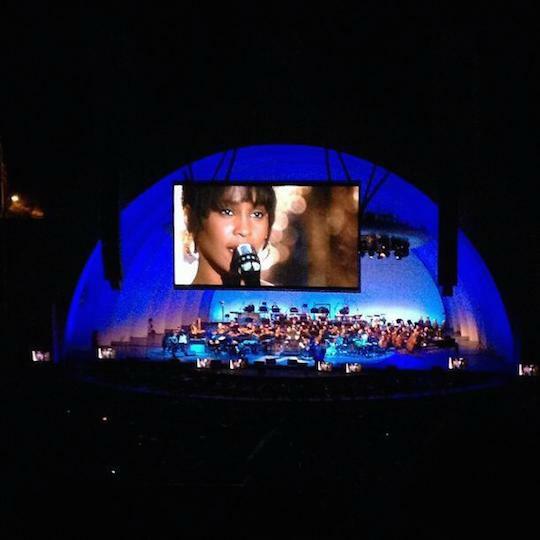 The Whitney Houston tribute was a highlight of the night. The orchestra provided live accompaniment to clips of her performing in THE BODYGUARD. The audience fell in love with her all over again. The Blaxploitation medley had many musical favorites like Theme From Shaft, Freddie’s Dead from Superfly, and Marvin Gaye’s Trouble Man. The clips were from all three films plus the filmographies of Pam Grier, Fred Williamson, Jim Brown, Jim Kelly and the inimitable Rudy Ray Moore. 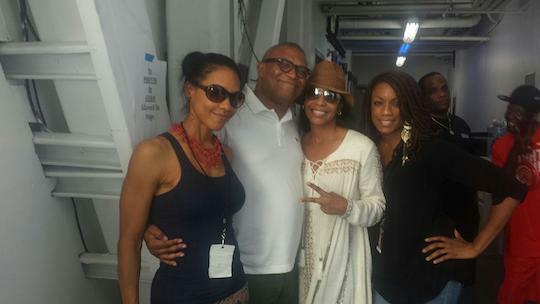 Me and the lovely ladies of En Vogue who sound and look great. Note Flav in the background. Maya’s dad Richard Rudolph convinced her to perform at the show. Thanks Richard! We took this picture intending to clown around but it turned out very beautiful. Bibi Green, who took most of the pictures you see here, isn’t just a great manager – she’s a heck of a photographer as well! Practice was going so well I called Craig Robinson to stop by. He felt the fire coming from Marcus Miller, Paul Jackson Jr. and Wah Wah Watson and hung for hours. 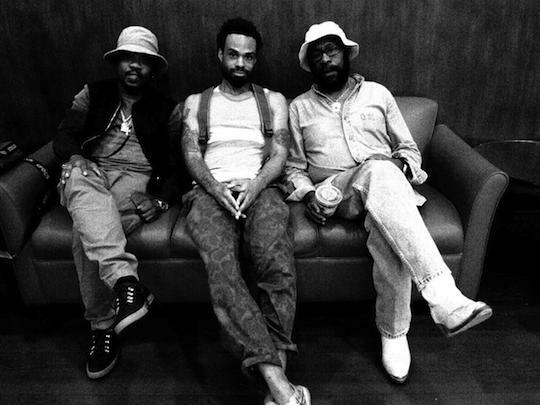 Soul men Anthony Hamilton, Bilal and Wah Wah Watson taking a break at rehearsal. 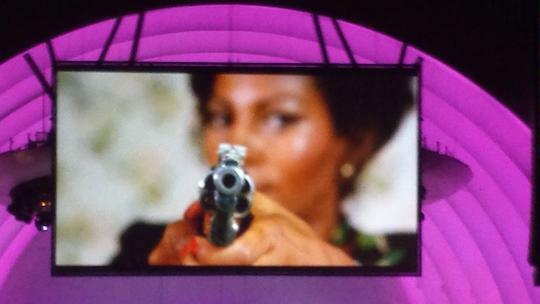 Princess (Maya Rudolph and Gretchen Lieberum) lit up the Hollywood Bowl on "Purple Rain"! 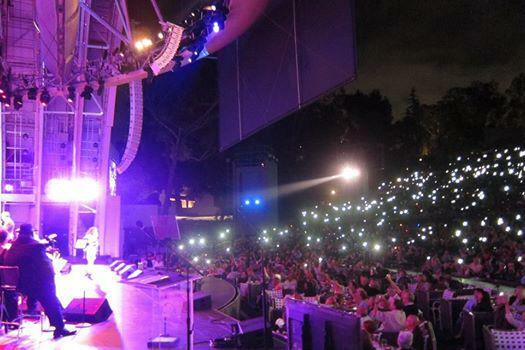 Thousands of cell phones waved to the groove of the Oscar winning masterpiece as Paul Jackson Jr recreated Prince’s guitar solo perfectly. 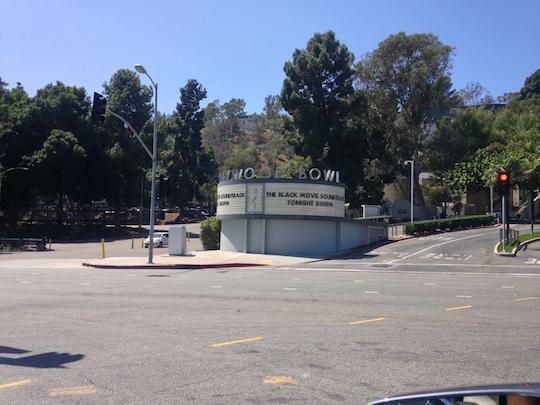 For those who have never been, this is what the Bowl looks like. 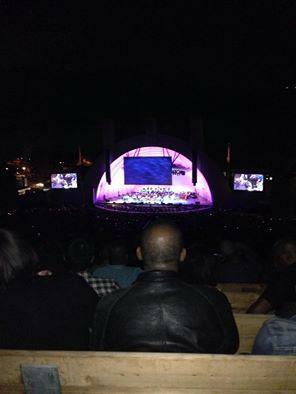 Large amphitheater with center and side screens for clips and shots of the performers. 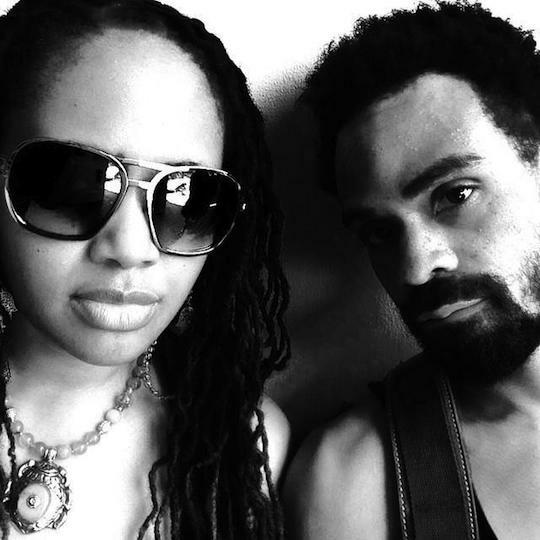 Thanks Nefetari Spencer for the picture! 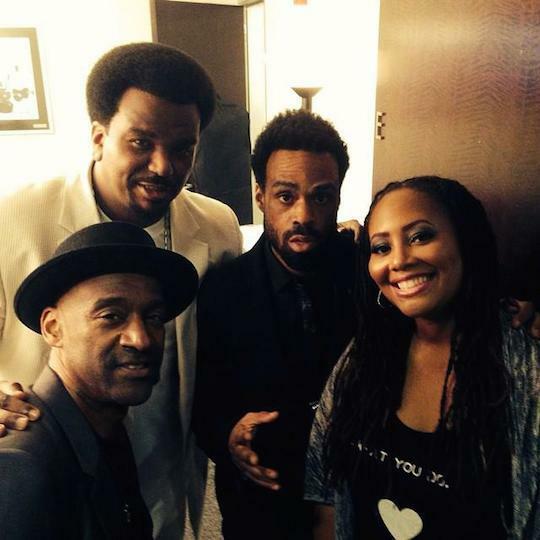 At practice with musical director Marcus Miller, host Craig Robinson, Laura Connelly of the Hollywood Bowl (with Brain Grohl of the Bowl blocked by my head). 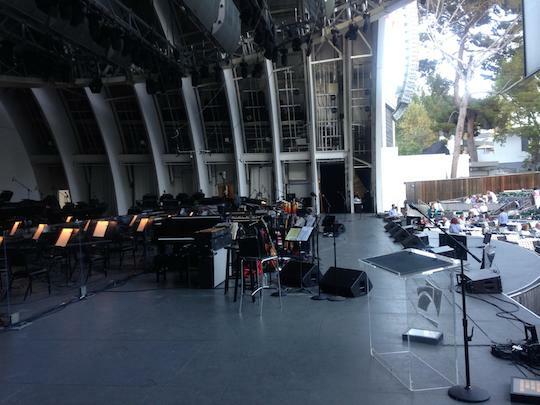 The Hollywood Bowl stage on show day. The quiet before the groove. 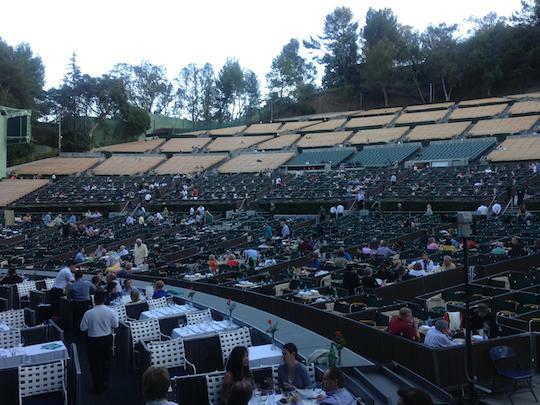 The audience gets to the venue way early and has a nice meal with a little vino before the show starts. Several longtime Bowl subscribers were impressed that the audience didn’t talk or eat through the show. Instead they were pumping it up regardless of age or race! 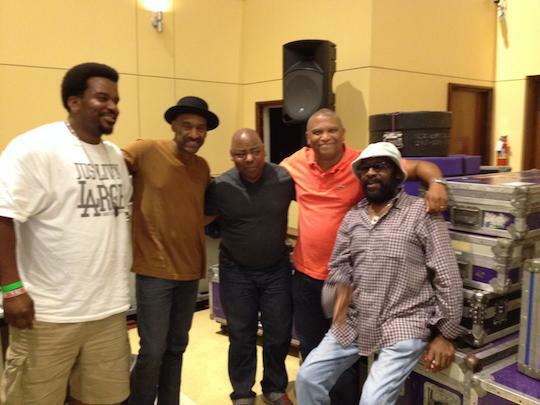 John Beasley, keyboards, Marcus Miller, bass and vision, Anthony Hamilton, percussionist Ramon Yslas (in front), the legendary Wah Wah Watson, guitar virtuoso Paul Jackson Jr, and next generation killers Kris Bowers on keys and Louis Cato on drums. Here are some of the songs you’ll hear in the show interspersed with an essay I wrote on the show. 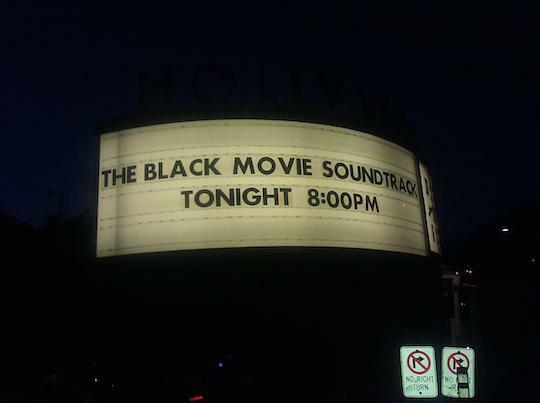 The Black Movie Soundtrack was born with the advent of sound in movies itself. When Al Jolson speaks directly to the audience and says “you ain’t heard nothing yet” before launching into a ragtime, Black music in movies is established as a signifier of what is modern and hip. 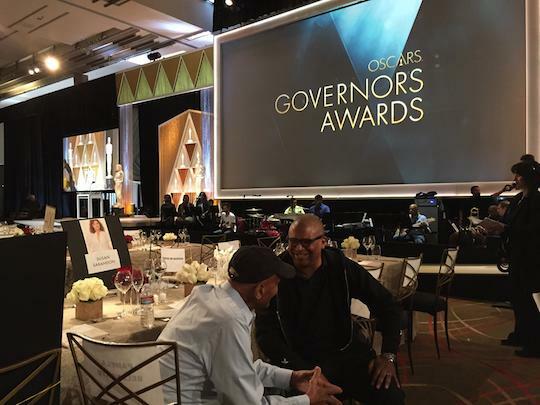 As musical styles evolved, from jazz to soul to hip hop, the significance of Black music in movies, regardless of the race of film’s cast, has been a dominant force in American cinema for nearly 100 years. 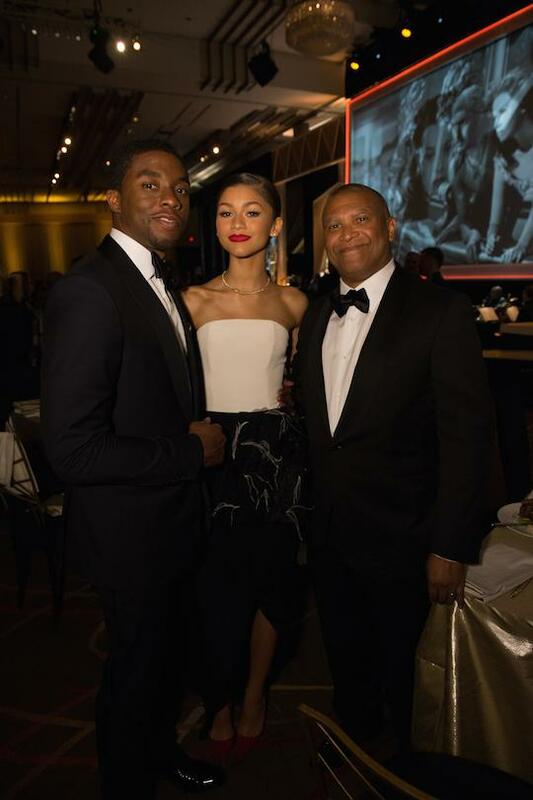 This is why tonight’s celebration of The Black Movie Soundtrack is so important. We will be showcasing some of the greatest music ever made. In fact, often, the music is better than the movies that showcase it. But in some ways, that is an unfair comparison. 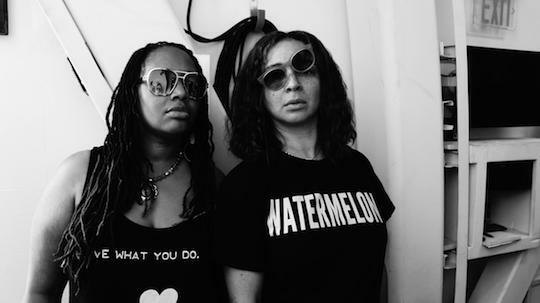 Black music is arguably the most sophisticated form of artistic expression in our culture. 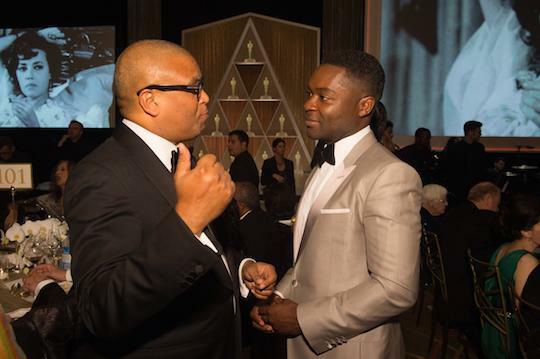 Movies are pretty great too, but it’s hard to compete with composers who wrote for film like Duke Ellington, Quincy Jones, Oliver Nelson, Isaac Hayes, Curtis Mayfield, Marvin Gaye, Prince, Marcus Miller, LA Reid & Babyface, Jimmy Jam & Terry Lewis, and Pharrell Williams. When I sat down to make a list of tunes to be featured in this evening’s program, the first pass was 130 songs long. Knowing that we would be lucky to fit 20 songs into the evening’s program, I had to accept the idea that an audience member would be disappointed by the absence of the their favorite jam in the lineup, so I apologize but it could not be helped. The good news is that the playlist was a bounty of riches, and could be edited in any number of ways. We could do a night of jazz tunes. We could have done three nights focusing on the great music soundtracks of the 1970s. We could do an evening of Prince’s music in movies alone. We could do a night of hip-hop in cinema. While those are all programs that we might try to execute in the future, we thought that it would be best to start with an overview of Black music in movies for the last 75 years. 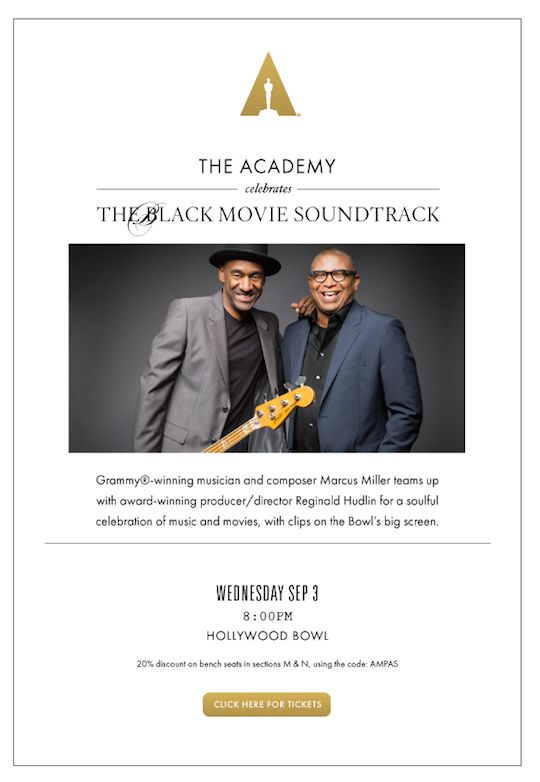 My first phone call was to my favorite music collaborator, the brilliant Marcus Miller. 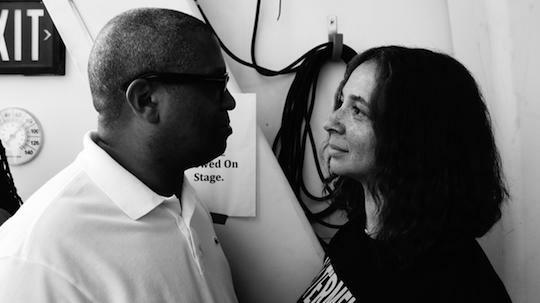 When we first started working together on the soundtrack of House Party, he told me about a week into his teenage years, when he was invited to join three bands: Miles Davis, Quincy Jones, and Weather Report. He chose Miles Davis and went on to produce several albums for him. With extraordinary dexterity, he was also Luther Vandross’ producer for his illustrious career. He also has a long career as a film composer for many directors including myself. 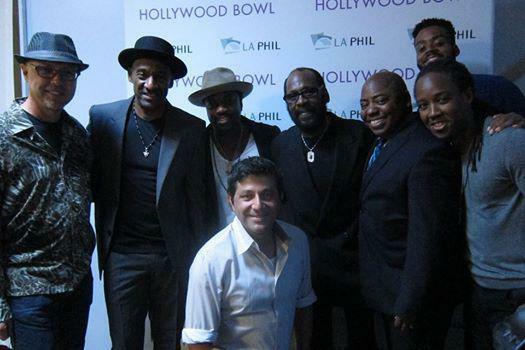 Marcus quickly fell into a working groove with Hollywood Bowl conductor Vincent Mendoza. Usually classic Black music is not revived, and if it is, it is stripped of its lush ornamentation. Not tonight. 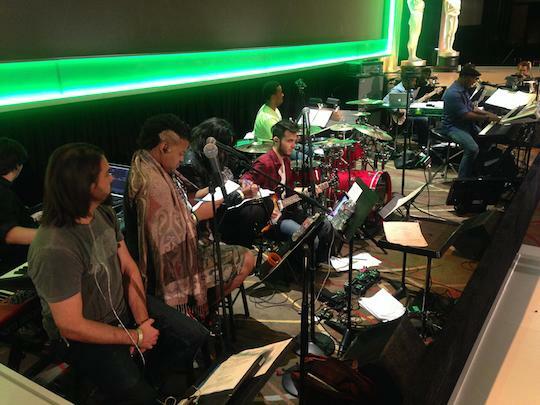 You will hear songs like Theme From Shaft with a full string orchestra! We are also making a point to feature score and not just hit songs in tonight’s program. You will be hearing some great score cues from movies like Sweet Sweetback’s Badasssss Song, Boomerang and He Got Game. In the same way Quincy Jones, Duke Ellington and Oliver Nelson were the most prominent composers of early black film soundtracks, the work of Isaac Hayes, Curtis Mayfield and Marvin Gaye dominates the 1970s “Blaxploitation” era. If there is a single song that personifies the idea of The Black Movie Soundtrack, it is Isaac Hayes’Theme From Shaft. A legendary songwriter with Stax records turned solo artist, for Isaac Hayes, Shaft was the perfect canvas to express his widescreen sonic ambitions with music that harnessed the power of an orchestra with the groove of state of the art soul music to make an enduring classic that won one for the most deserved best song Oscars in Academy history. Sparkle was one of three soundtracks by Curtis Mayfield. He was already a legend from his work with The Impressions, with songs like People Get Ready and Gypsy Woman, as well as huge solo career. But one could argue that Curtis Mayfield’s work on Superfly was his masterpiece. The lyrics of the soundtrack create a great chorus effect that critiques the story and the characters on screen. The combination of the music, the fashions, and the timely storyline all combine to make Superfly one of the most important films of its era. In addition to Superfly and Sparkle, Curtis Mayfield famously collaborated with Gladys Knight on the soundtrack to Claudine, another beloved film whose music is integral to the popularity of the film. Marvin Gaye’s Trouble Man is an underrated soundtrack, although aficionados of the genre love it. Marvin was not happy with the soundtrack for Trouble Man, so he rerecorded it entirely before it was released commercially; meaning the music in the film is quite different from the music on the album. 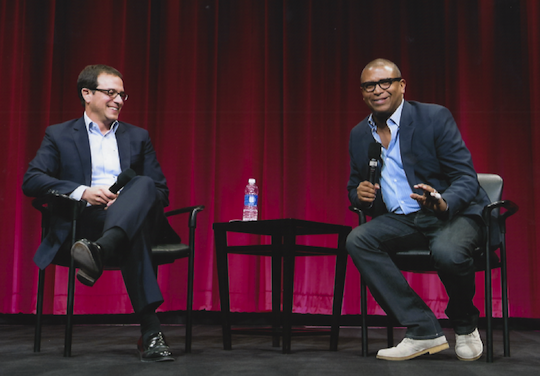 Years later, John Singleton used large chunks of the score for his action film Four Brothers. The next Black artist to receive an Oscar for best song is Prince for Purple Rain. All of his soundtrack albums – Purple Rain, Parade, Batman And Graffitti Bridge – capture a genius at the peak of his talents. The beat goes on with Pharrell, whose work on the Despicable Me franchise is as impactful as his hit records with Jay Z, Snoop and his own solo career. Happy is one of the most accurately named songs in history, and it achieves the goal of any artist – to bring the whole world together on the One. 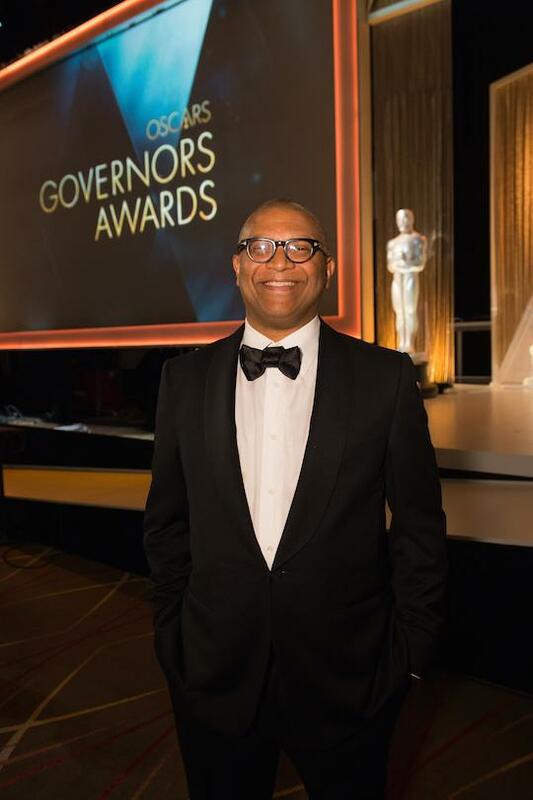 I would like to thank the Academy of Motion Pictures, the Hollywood Bowl, Laura Connelly, Cheryl Boone Isaacs, Marcus Miller, Vince Mendoza, Jeff Kent and our host Craig Robinson for making a dream come true. I wanted to post these earlier, but I was too busy making the doggone show! 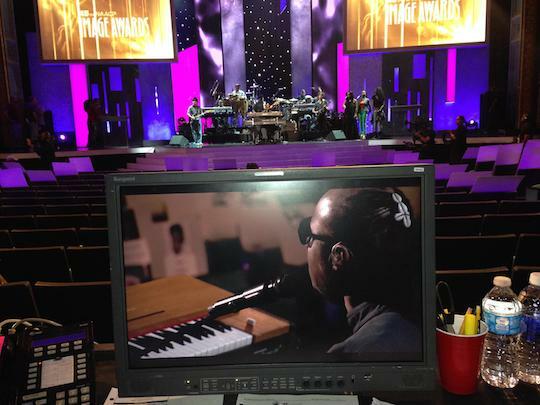 Here’s Stevie Wonder, America’s National Treasure, in rehearsal. One of the keyboardists in his band was jamming one of my favorite songs, Weather Report’s YOUNG AND FINE to warm up. After hearing Stevie run it down, I made the executive decision to give him more time and add one more song to the medley. More is always more with Stevie. 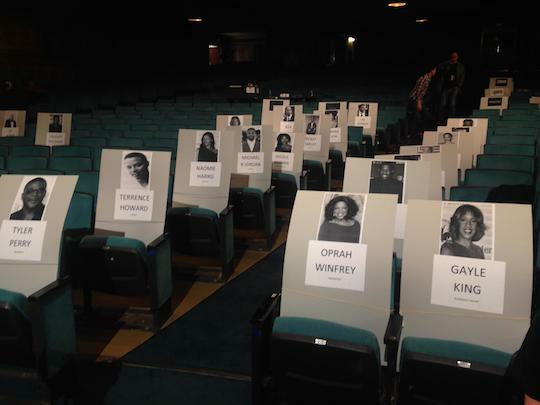 These signs help the crew in rehearsal so they know how to position themselves to capture crowd reactions and winners as they walk to the stage. 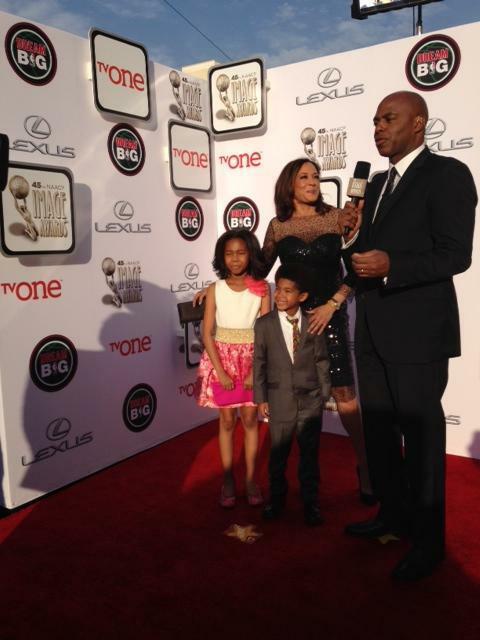 California Attorney General Kamala Harris with her very adorable Godchildren being interviewed on the Red Carpet by Kevin Frazier. 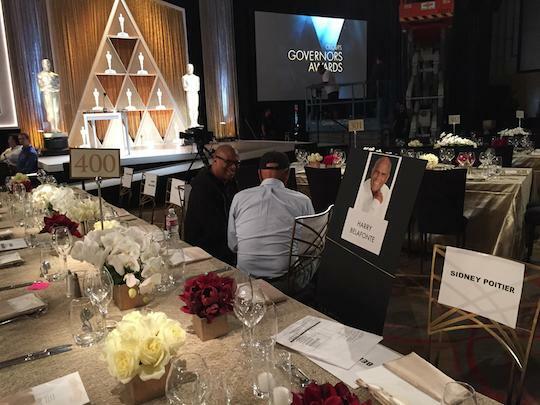 During the Red Carpet show (a NAACP Award first! 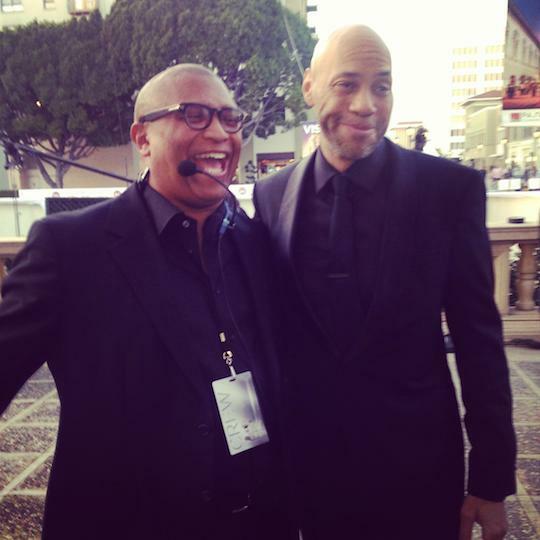 ), I ran into screenwriter John Ridley, who won an Image Award and an Oscar for 12 YEARS A SLAVE. 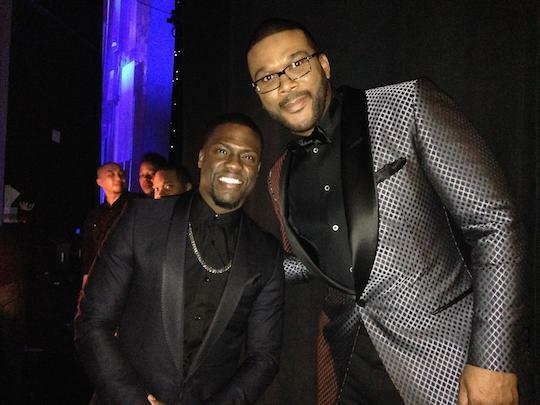 When I saw two the biggest stars in Hollywood talking backstage, I had to capture Kevin Hart and Tyler Perry together. Kevin was the big winner of the night with awards for best actor in a sitcom, best sitcom for REAL HUSBANDS OF HOLLYWOOD and Entertainer of the Year. 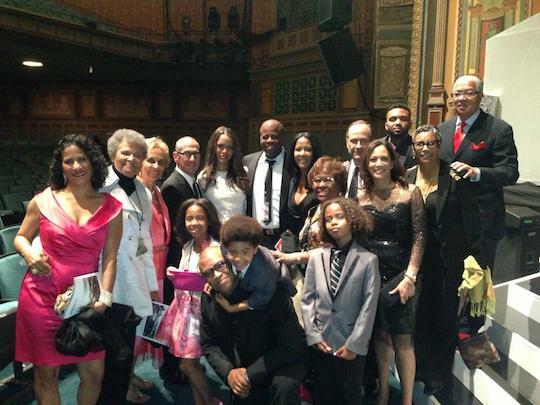 After the show, me and fellow producers Phil Gurin and Byron Phillips took a picture with friends and family. Many of these people grew up with me in East St. Louis. Others are more recent but no less dear. These people are what it’s all about. 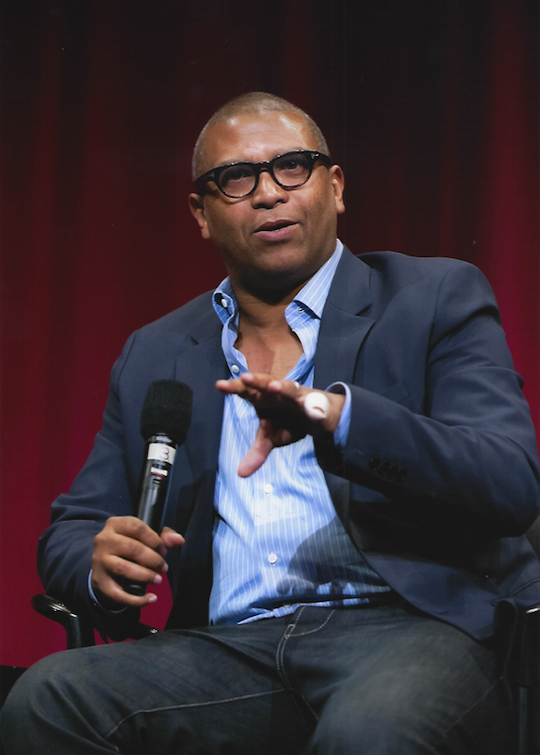 Reginald Hudlin Interviews Denys Cowan On The Importance Of Education! Denys Cowan and I attended an education conference given by Black Enterprise and the Bill and Melinda Gates Foundation. ProfessU, one of the attendees, wanted to interview us, so I took the mike and interviewed Denys about his educational background. The results may not be what he had in mind when he asked us to do it, but it was still very interesting. 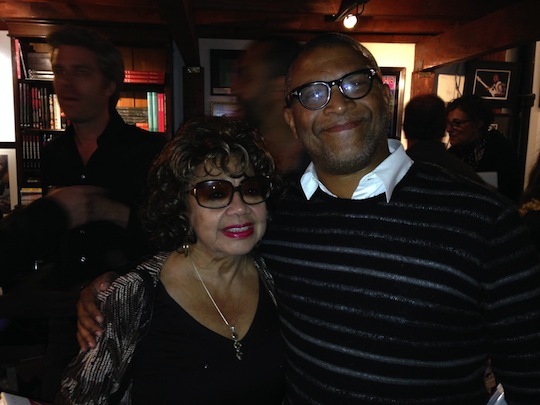 Me with Miles Davis’ ex-wife Frances. 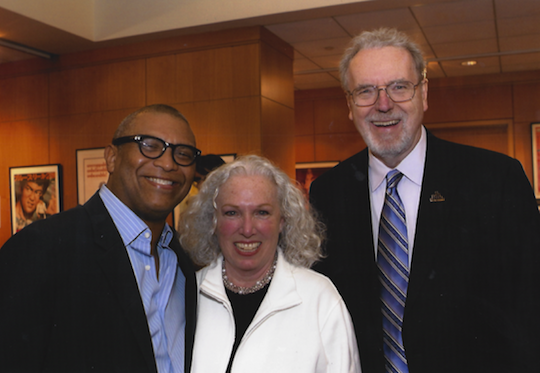 My wife met her years ago and she kept her fascinated with great stories from her life. 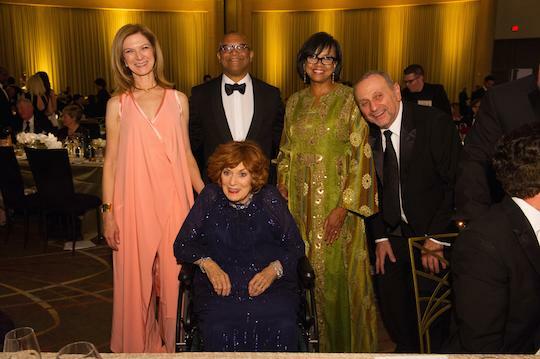 She danced with the great Kathrine Dunham, who changed our families’ life as well. 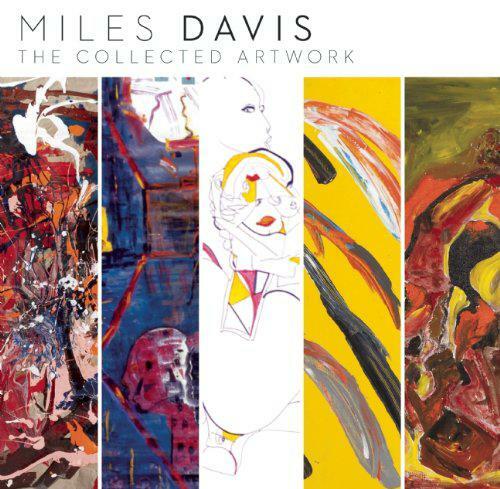 The Davis family hosted a small exhibition of Miles Davis’ art at a gallery in Los Angeles to celebrate the publication of a coffee table book of his work. 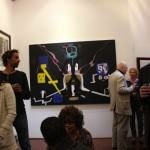 The art was cool, with music spun by the son of Stanley Clarke. 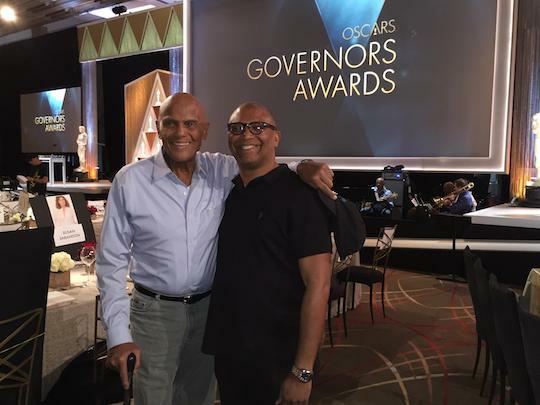 I kicked with Vince Wilburn, Miles’ nephew and a bandleader his self; Nas, who calmly told a hear-wrenching story of owning and losing an original piece of Miles’ art; and some folks who know my mom, because everywhere I go in LA I meet people who love my mom. She has a busier social life than me. 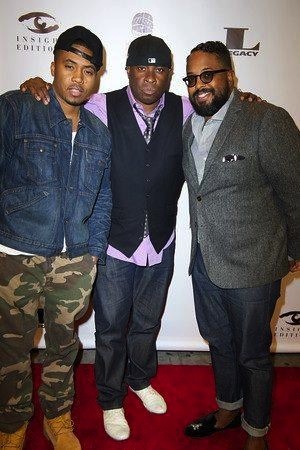 Nas, Vince Wilburn, Miles’ son Erin Davis. Vince grew up in East St. Louis too. Rick Hess, an old friend of mine I met when he was an executive at TriStar when I first came to Hollywood, called and asked if I would speak at the graduation of Inner City Filmmakers, which I was glad to do. I knew if Rick was involved, it was worthwhile, and I’m always happy to talk to kids. This was one of those events that is so inspiring, I worked extra hard to give to the kids as much as they were giving me. I met the kids at the reception where we took this picture. 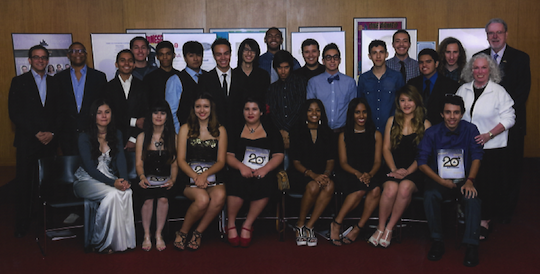 Mainly Latin and Black kids who otherwise would not get a chance to work in the entertainment business. The folks who put it together are Fred Heinrich and Stephania Lipner, a husband wife team who basically gave up a successful career in commercials to do this full time. 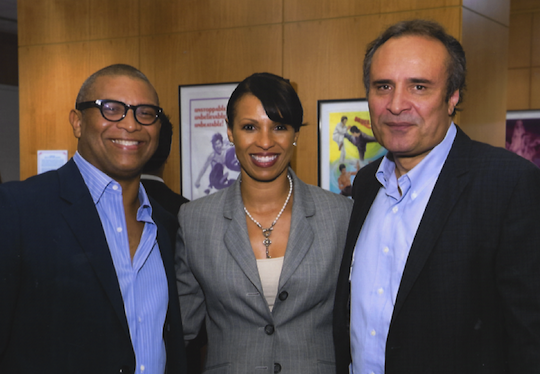 The event was at the Academy of Motion Pictures…here I am posing with two of their executives. 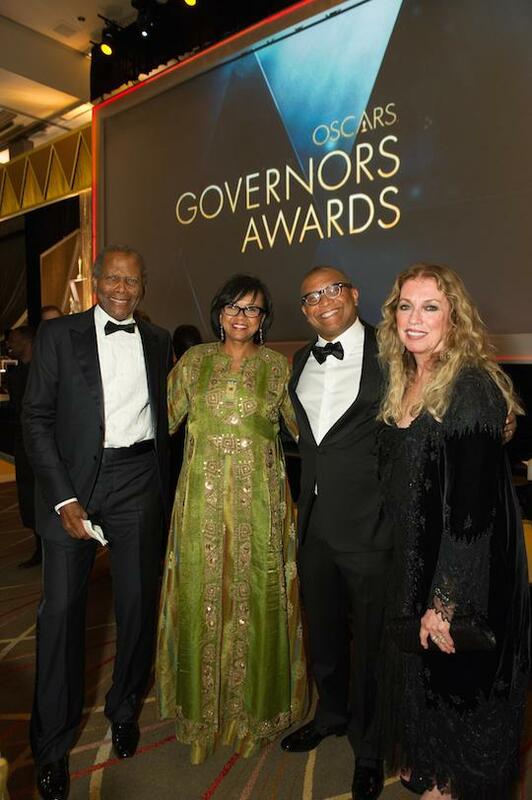 Bettina Fisher heads up their education efforts, and Vic Bullock just joined the organization after a long tenure at the NAACP. First they showed a reel of alumni of the program who have gone on to have great careers in the business, down to winning Emmys. Then I got up and did a question and answer session with Rick Hess (who is Chairman of the ICF Board) and then opened it up to questions from the audience. The questions were smart, real, and made me dig deep. 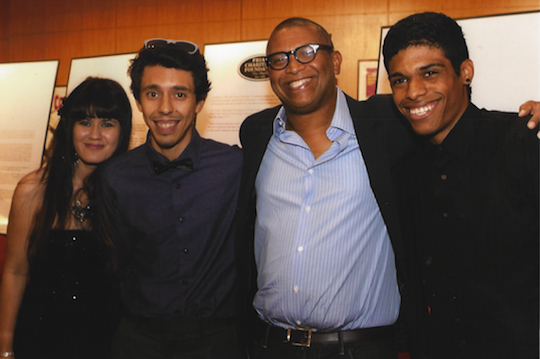 Afterwards they showed the short films the kids did…so much great talent! I hope to bring some of them onboard my upcoming projects.